Weston Meters were made in the UK and USA by Sangamo Weston, and the differences between the two are very minor but they have different model numbers. Some later models were made by other manufacturers under licence. The US company was founded in 1888 Springfield Illinois as a manufacturer of electrical measuring instruments with a factory in Newark NJ, with the UK company following on in Enfield Middlesex a year later. In 1954 the US company was bought out by Daystrom, then in 1962 Schlumberger took over Daystrom. In 1974 the Newark plant was shut down. In 1987 there were investigations going on over contamination of the surrounding land. Sangamo manufactured PCB-containing electrical capacitors there during 1955-74. Sangamo notified the US Environmental Protection Agency of its disposal of approximately 38,700 cubic yards of PCB waste on its plant site and an undetermined amount in seven satellite dumps, all in the Twelve-Mile Creek Basin. Solid, sludge, and liquid wastes were stored or disposed of in piles, landfills, and impoundments. How nice! Since then Sangamo-Weston has removed over 17,000 cubic yards of waste from past disposal areas on and off the plant property. How sad it should all end this way - I'm sure Edward would be turning in his grave if he knew. Weston's plant in Newark NJ. A bit more complicated in the UK. In 1936 British Sangamo of Cambridge Arterial Road, Enfield, Middlesex who had made meters and time switches at that address since being founded in 1921, bought 51% of the UK company who were then on the Kingston Bypass, Surbiton, Surrey and moved their operation to Enfield. They became a public company in 1935. In 1977 British Schlumberger took over the company including Weston. Up until then, they were distributed by Ilford Ltd, then and still the supplier of choice for monochrome photographic materials. This continued until 1980 when Sangamo Weston were involved in various takeovers and amalgamations being rather grandly known as Weston Aerospace at one time. Making exposure meters was probably considered unprofitable by the new owners so it was left to John Gahagan, a former manager there to set up East Kilbride Instruments in Scotland to continue manufacture of the Euromaster. Manufacturing continued there until July 1984 when that company went into liquidation. A sad but familiar story. Fortunately a white knight in the shape of Tottenham-based instrument repair specialist Megatron, bought the parts and stocks, and took started manufacturing the Euromaster 2, strangely just 3 miles from the original factory at Enfield. Megatron sadly went out of business in February 2010 so Weston manfacturing is no more. Meanwhile the non-exposure meter part of the company was bought by Norwich Aerospace in 1998 and since 2003 has been part of Esterline. For a really good thorough account of the company, do read the book Measuring Invisibles which is available online here. James Ollinger has some history on his excellent website. Ian Partridge has some fully restored meters for sale on his website and is a great repair guy in the UK. For all the history buffs out there, here is an interesting letter from a former employee, Charles J.Mulhern. Of course, with the advent of digital cameras, only a few professionals and very serious amateurs use separate exposure meters, so any company that relied on them was going to have a problem - just as Kodak had with film. Mechanical electrical measuring instruments similarly - now only aircraft really use them as most are digital or simply readouts on a computer screen. So really, it was the end of an era but we are fortunate indeed to have plenty of these beautiful instruments around that we can treasure instead of having to use. Edward Weston was an Englishman Born: May 9, 1850 and who Died: Aug. 20, 1936 in Montclair, N.J. U.S. By 1900 -1920 he was living in Essex NJ with his son Edward Faraday and Minnie Weston who was 46 in 1900. Minnie Weston - what a name for a small exposure merer! He was an electrical engineer and industrialist who had already revolutionized the Electro-plating industry when founded the Weston Electrical Instrument Company in 1888. A prolific inventor who held 334 patents, Edward Weston helped revolutionize the measurement of electricity. In 1886 he developed a practical precision, direct reading, portable instrument to accurately measure electrical current, a device which became the basis for the voltmeter, ammeter and watt meter. Oh, and in his spare time, he later produced the world's best exposure meters! Edward Weston was born in the rather dull town of Oswestry, Shropshire (England), in 1850 and brought up in nearby Wales. His father was an unsuccessful merchant, and mother was a novelist, as well as a magazine writer - perhaps that is why his manufacturing plant eventually went bust but his manuals were so good. Edward Weston attended the Adams School. He studied medicine at the insistence of his parents and began his career as apprentice to a local physician where he developed an interest in chemistry After receiving his medical diploma in 1870, he went to New York City, at the age of 20 where he soon found a job in the electroplating industry. He started making improvements and during the first eighteen months in America, he is described as "revolutionizing the Electro-plating industry". He realized that a constant source of current was required for quality plating, and the batteries used at the time were not sufficient for the job (not a lot changed there then). After the first company he worked for went out of business, Weston had a short career as a photographer, but returned to the plating industry in 1872 after realising that there was only room for one photographer called Edward Weston. He then opened a business in partnership with one George G. Harris, the surprisingly named Harris & Weston Electroplating Co. He patented the nickel-plating anode here in 1875 and then developed his first dynamo for electroplating - a machine described as being rational in it's construction, whatever that may mean. Whatever it means though, it apparently raised the efficiency of dynamos from just over 45% to over 90% in 1875..
Fed up by 1875 with electroplating, he moved to New Jersey, in business for himself making dynamos, called with abounding creativity The. Weston Dynamo Electric Machine Company. Frustration with inadequate electricity supplies led to an obsession with power generation (better be frustrated with that than some other things though). In 1876 he patented a design for a dc generator. One of Weston's dynamos, running electric arc lamps, was shown at the Centennial Exposition in Philadelphia in 1876, but it received surprisingly little attention. 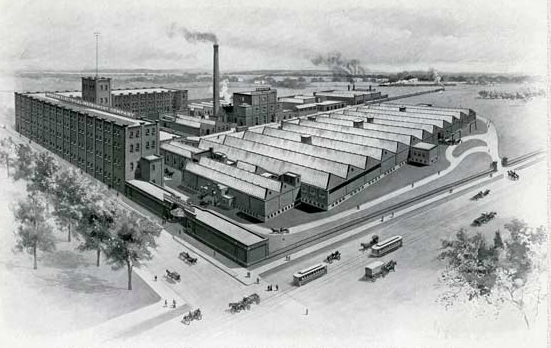 Shortly after this, Weston was contacted by Frederick Stevens, who offered Weston the opportunity to set up a dynamo division of his Steven, Roberts & Havell company. In 1877 the division was organized as a separate company, the Weston Dynamo Machine Company, in Newark, New Jersey, - the first US factory of it's kind. To expand the market, he began making generators for arc lighting. Inevitably, innovations and improvements to the lamps themselves followed and, due to its success, the company changed its name to the Weston Electric Light Company, going on to win the contract to illuminate the new Brooklyn Bridge. At the same time, independent of Edison and others, Weston was experimenting with incandescent light. Using his knowledge of chemistry, electricity and mechanical engineering he designed a carbon filament of unprecedented uniformity and longevity, subsequently used in all incandescent lights until the introduction of tungsten 25 years later. From 1875 to 1884, Edward Weston was granted a total of 139 US patents, yet despite this prodigious output, his best was still to come... Weston's arc lamp Weston had first used a carbon arc lamp in his own shop in 1874, run by his plating dynamo, and he continued to research lighting equipment. By 1877 he had made many developments in arc lighting and in 1878 he put an arc light on the Newark Fire Department's watchtower in the center of town. Publicity from this led to an order from the city for lighting Military Park, and this was followed in 1879 by an installation in Boston's Forest Garden. On 26 September 1882 he was granted a patent on the Tamidine filament, a carbon material which gave a bulb life of up to 2000 hours, when other materials burned out after only a few hundred hours. Weston also took out patents on incandescent lamp seals and many other inventions in the lighting field, and by 1886 had been granted 186 patents. His electric arc furnaces and incandescant lamps were as good as Edison's or Swan's, if not better, and his filaments were used until the tungsten became available. In 1888 he developed a practical precision, direct reading, portable instrument to accurately measure electrical current, a device which became the basis for the voltmeter, ammeter and watt meter. The Weston Standard Cell, developed in 1893, was recognized as an international standard and was used by the National Bureau of Standards for almost a century to calibrate other meters. His company, Weston Instruments, produced world famous precision electrical measuring instruments including volt, amp, watt, ohm, and HF meters, current /potential transformers and transducers. In 1930, Dr. Edward Weston helped found Newark Technical School, predecessor to New Jersey Institute of Technology, and served on its Board of Trustees. Weston became a U.S. citizen in 1923. In 1932 Dr. Edward Weston received the Lamme Medal "For his achievements in the development of electrical apparatus, especially in connection with precision measuring instruments.His many other achievements are shown at the foot of this page. Edward Weston died in 1936, aged 86, with more than 300 patents to his name. His legacy lives on with the marvellous Weston Exposure Meters. At some point during all this he managed to find the time to see Mrs Weston and produce a son, Edward Faraday Weston (1878-1971) who's middle name perpetuated his father's reverence for England's great Physicist. In 1928/9 Weston and his son began to experiment with exposure-meters by the use of the Photo-electric cell (the magic eye), which Weston was producing. The elder Weston was apparently still a keen Photographer and who saw it as a useful tool. In 1931, Edward Faraday Weston applied for a U.S patent on the first Weston Exposure meter, which was granted patent No. 2016469 on October 8, 1935, also an improved version was applied for and granted U.S patent No. 2.042665 on July 7th 1936. From 1932 to around 1967, over 36 varities of Weston Photograhic Exposure Meters were produced in large quantities and sold throughout the world, mostly by Photographic dealers or agents, which also included the Weston film speed ratings, as there were no ASA or DIN data available at that time. Weston had two factors which contributed to the success of the meter. First was a patented method of making the cells. They were coated and sealed so that they were relatively immune from moisture, which kills Selenium cells. Weston meters that do not react to light at all have generally lost this seal due to deterioration. Secondly was the Weston method of measuring film speeds. While it had some shortcomings it had the advantage of being based on a method which gave practical speeds for actual use and it was independant of any film manufacturer. Previous speed systems such as the H&D and early Schneiner speeds were both threshold speeds and capable of considerable manipulation by manufacturers. Weston's method measured the speed well up on the curve making it more nearly what one would get in actual practice. (This means that he was a bit less optimistic about film sensitivity than the maunfacturers of the day who were notorious for pretending their films were more sensitive than they really were) A certain Mr W.N.Goodwin of Weston is usually credited with this system. The Weston calculator also shows some thought about what the practical photographer had to deal with. From the first these calculators had markings on them for determining the scene contrast and the instructions with the meter told how to do this, a sort of early zone system. Some older meters incidentally can become non-linear so can't be corrected by a simple factor like adjusting the film speed. Take a deep breath… Electric motors, potential transformers, current transformers, A.C and D.C. voltmeters, ammeters, wattmeters including polyphase, ohmmeters, both A.C and D.C laboratory standards, standard cells, panel meters in hundreds of sizes, shapes and ranges, power factor meters, control relays, tachometer generators, A.C and D.C. amplifiers, radio tube (bulb), radio test instruments, insulation testers, multi-range, multi-purpose industrial circuit test instruments, mutual conductance electronic radio-tube analyzers, A.C. industrial test units, A.C clamp ammeters and voltmeters for powerline works, moisture measuring meters, electrical and mechanical recorders and controllers, thermometers mercury tube, thermocouple and bimetal types, hydrometers for all branches of chemistry, ground detectors, humidity indicators, meggers, frequency meters, sensitive relays, laboratory standard electrical measuring instruments, aircraft navigational and engine condition instruments, including the first-blind landing instrument in 1933, switchboard instruments, shunts, resistors, D.C. galvano-meters thermal converters, copper oxide rectifiers, projection instruments, VU meters, photoelectric cells initally used in illumination meters, light meters and foot-candle meters. The magnetic speedometer, and the dashboard ammeter for Harley - Davidson motorcycles. Applied the dynamo to electroplating (1872). Patented the rational construction of dynamos (1876). Patented laminated pole pieces and cores for dynamos, raising their efficiency from about 45 per cent to 85 per cent (1875). Gave a public exhibition of arc lighting in the United States (1877). Used a soft metal core for arc light carbons (1878). Copperplated the ends of arc light carbons (1878). Used an electric arc furnace industrially in the United States (1875). Made a successful homogeneous carbon lamp filament (1885). Cured weak spots in carbon lamp filaments with hydrocarbon flashing process (1885). Made nitrocellulose into pure fiberless cellulose (1885). Made a truly permanent magnet (1887). Compounded a German Silver alloy containing 30 per cent nickel (1887). Made a metal having a negative temperature co-efficient (1887). Made a metal having an extremely low temperature co-efficient (1887). Made an aluminum alloy which could be drawn to very thin tubes (1887). Made a commercial, direct-reading electrical measuring instrument (1888). Used the shunt circuit (1893 - US Patent No. 497,482). Made a stable cell for use as a secondary standard of the volt (1893). Developed the magnetic drag-type speedometer (1885). Made an ammeter for use with automobile starting batteries (1911). Instruments such as the Weston A.C. Voltmeter, Model 155 Weston Electrical Instrument Corp. Newark N.J.,(c 1926) were used by trained technical/scientific staff for precision laboratory measurements of voltage, and as secondary standards for calibrating other meters. The mirrored scale makes it easier to read the instrument to a given accuracy by enabling the user to avoid parallax errors. This particular instrument was specified to be accurate to ±0.5%. 1935 Bi-metal thermometer. The first "electric eye"